I'm excited to announce the launch this week of our range of luxury party bags. Made from environmentally friendly unbleached cotton and featuring the same funky designs as our recycled personalised party bags , they are the ultimate in posh party bags! 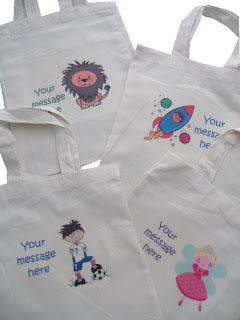 Each bag is printed with your own message and one of our funky cartoon characters, designed especially for us. You won't find these designs anywhere else! If you are planning a wedding this year (or know somebody who is), we have some gorgeous wedding designs too, so you can give your young VIP's their own wedding activity bag to keep them happy during the quiet times.